Hi, everybody! 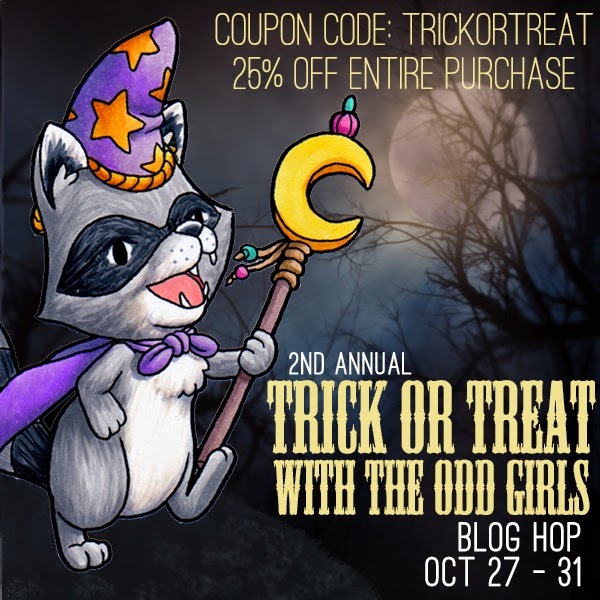 Welcome to Some Odd Girl‘s 2nd annual Trick or Treat Halloween Hop! We’re so happy that you’re joining us! You might have arrived from LEAH’s blog – if so, you’re on the right track! If not, you’ll want to CLICK HERE to get things started, because you won’t want to miss a thing! All of the Odd Girls have concocted creepy little creations to inspire you today, and you’re invited to visit each blog to see what’s been brewing! We’ll be sharing some of the projects at the Some Odd Girl blog over the next few days, but TODAY, we kick things off with the hop! 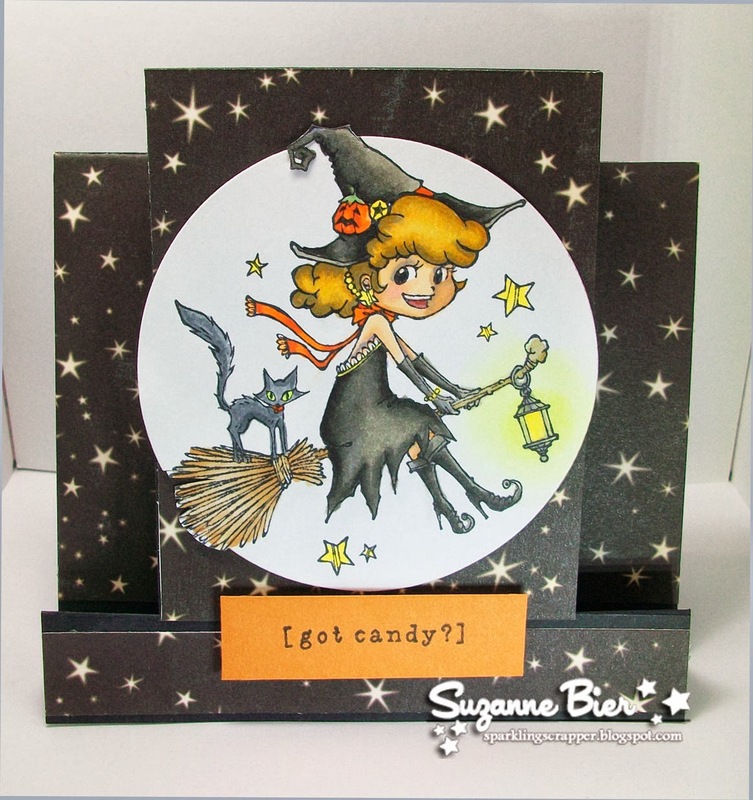 I made three Halloween cards to share with you today featuring “Cauldron Tia“, “Halloween Tia” and “Witchy Mae“! AND, so you can snag even more treats, we have a discount code for you! Our hop runs until October 31st at midnight Eastern, and we’ll announce the winners on the Some Odd Girl blog on Monday, November 3rd. Happy Haunting and HOPPING! Your next stop is ALEXIS! Thanks so much for stopping by today! “Witching” you a very happy Halloween from all of us at Some Odd Girl! Lawnscaping Facebook Inspiration Team Challenge! Hi, everybody! I have a few cards to share today featuring Lawn Fawn stamps and papers for the design team call for the Lawnscaping Challenge’s Facebook Inspiration Team. I’ve been participating in the challenges at the Lawnscaping Challenge blog for a while now, and thought it would be fun to try out for the team! 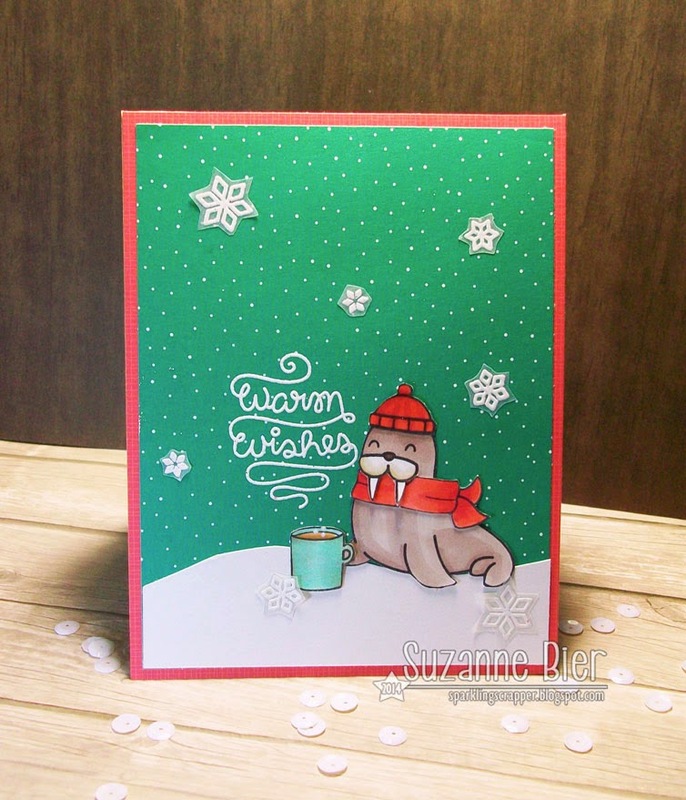 For my first card, I combined stamps from Lawn Fawn’s “Critters in the Arctic” and “Love You A Latte” sets with papers from the “Snow Day” and “Peace Joy Love” petite paper pads. The walrus’s scarf is from the “Winter Owl” set, and the coffee cup is from the “Winter Fox” set. 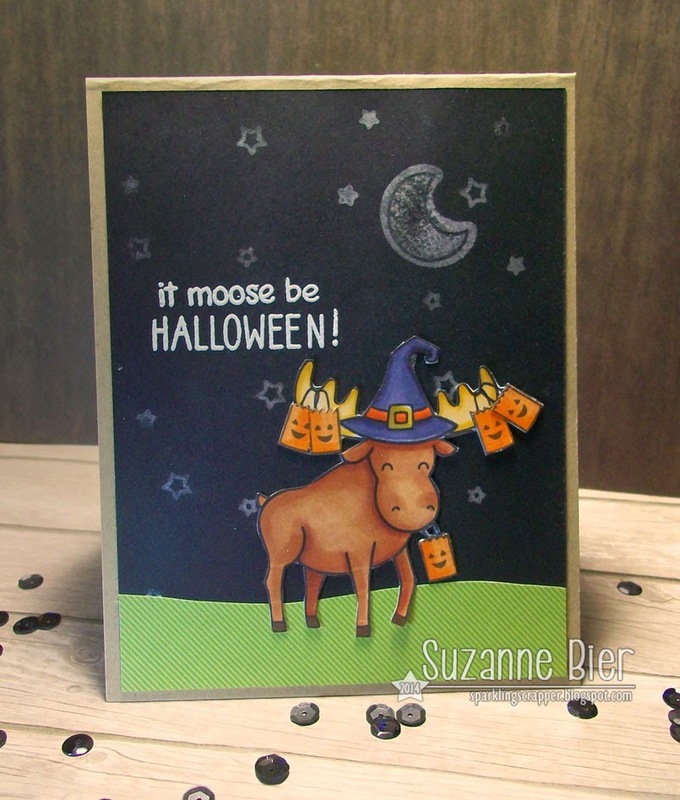 My second card is a different take on the moose in the “Critters in the Arctic” set. I dressed him up for Halloween with some props in the “Spooktacular” set. And, there’s no way he’s going trick or treating with just one treat bag, so I gave him five! My third card is inspired by an idea I had to combine one of the sentiments from the “Science of Love” set with some other stamp sets to make a “punny” Halloween card. I stamped the back of one of the cookies in the “Milk and Cookies” set with watermark ink on vellum and heat-embossed them with opaque white powder. To make the other parts, I used a circle punch and a regular hole punch on some paper scraps. The jar is from the “Summertime Charm” set and the tag sentiment is from the “Spooktacular” set. The chevron paper is from a retired Lawn Fawn paper pad. 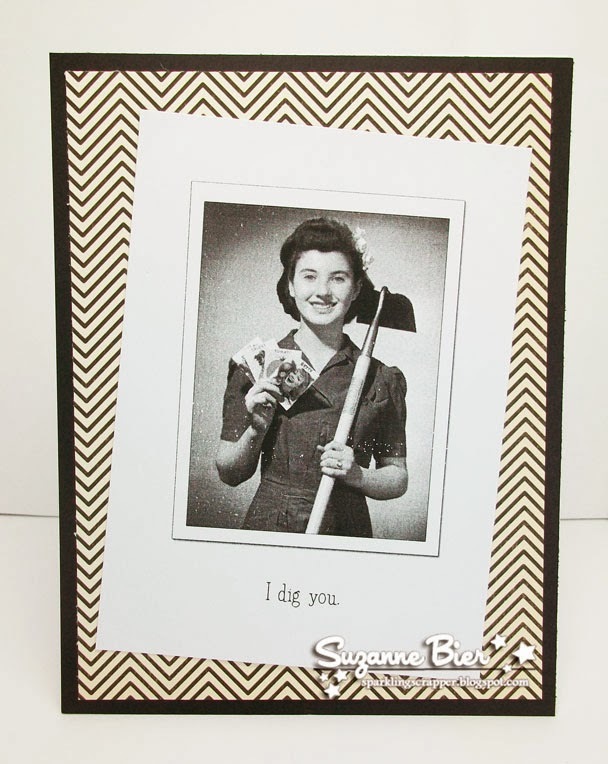 Hope you enjoyed checking out my cards today! I hope you’ll be inspired to mix and match some of your stamp sets to make something new! Thanks so much for stopping by, and I hope you’ll get some crafty time to make something fun over the weekend! Hi, everybody! Hope you are having a good week so far! I’m playing along with the current Lawnscaping challenge, which is to make a one-layer card. My order with the new Lawn Fawn stamp sets came in yesterday, so I started playing with them! As you’ve probably noticed with other cards I make, one of my favorite techniques is creating a scene with masking, which is perfect for this challenge! 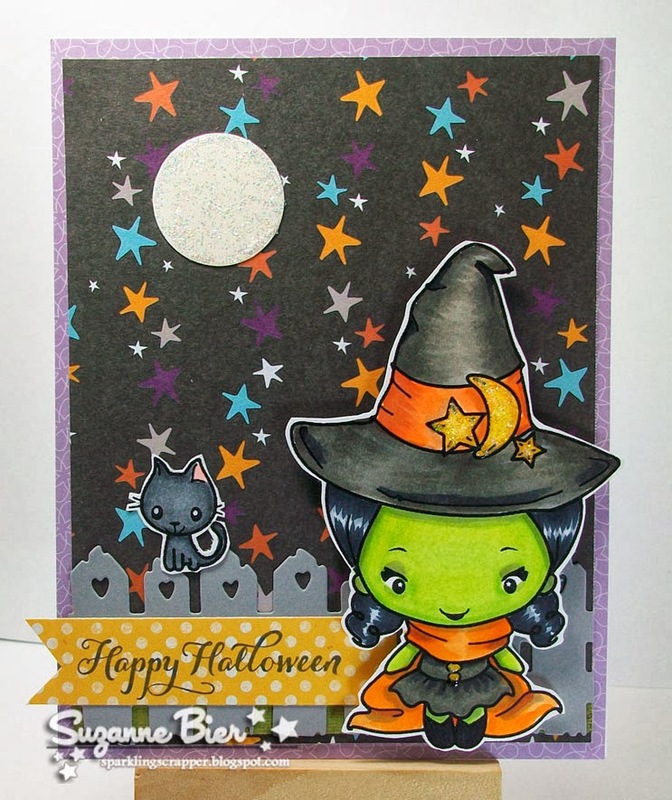 Except for the grass stamp, all of the stamps I used are from the brand-new “Spooktacular” set. You’ll find the grass stamp in “Critters at the Dog Park“. I created the background by masking off all the stamped images and sponging on a few shades of purple ink. Then, I colored the images and heat-embossed the sentiment. I would have liked the embossing to be sharper, but that’s my fault…I didn’t let the background ink dry long enough. I think that I’ll stamp the sentiment before creating the background when I try this technique again. 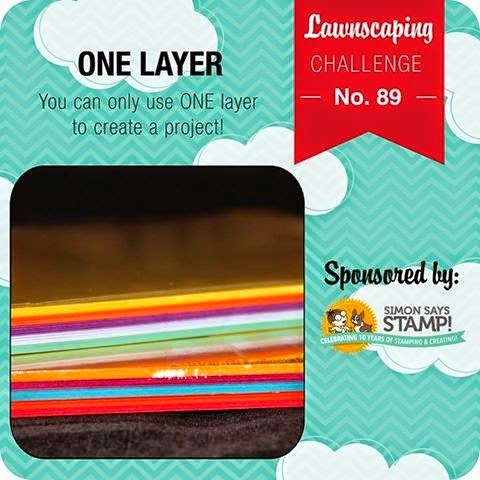 For all of the details on this challenge, or to link up your entry before the deadline (Wednesday, September 10th), stop by the Lawnscaping Challenge blog! And while you’re there, check out what the DT made for the challenge…there’s lots of fun, one-layer inspiration! Happy Halloween, everybody! 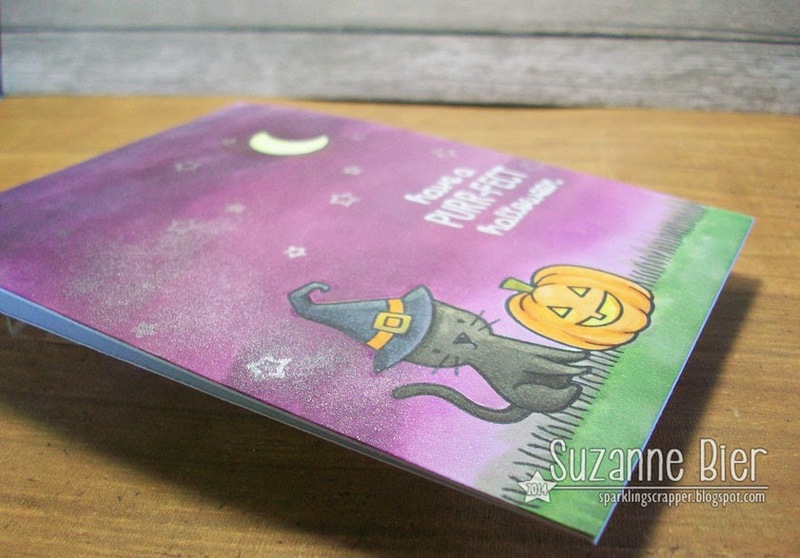 I won’t be getting any little ghouls or goblins ready for trick or treating tonight, but I wanted to share some fun (and delightfully creepy) cards with you! This is the fourth time we’ve done a Grim Creeper event. If you want to check out the other hops we’ve done, click HERE. I have two cards today. Both were made with free retro photos that I found online. 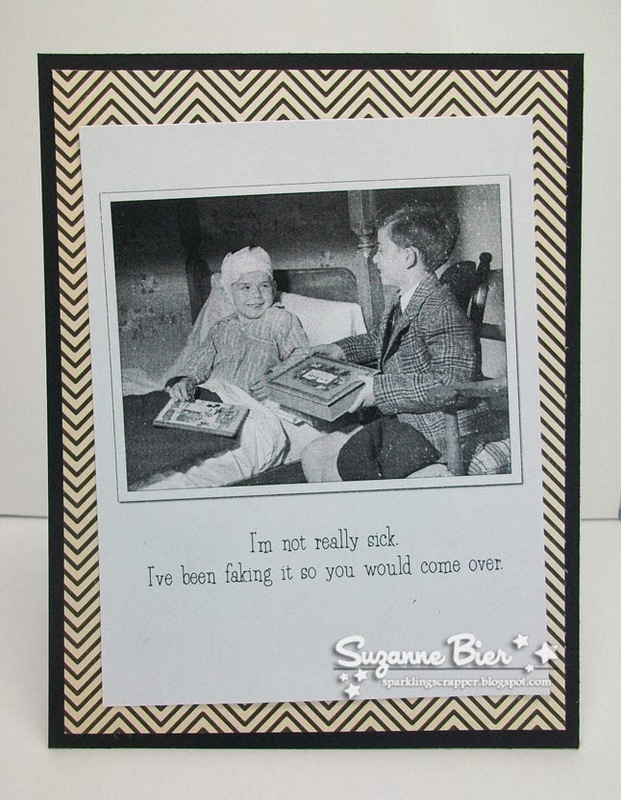 I just picked a couple for my cards, and paired each photo with a creepy sentiment. I love that they pay tribute to shows like “Alfred Hitchcock Presents” and “The Twilight Zone”. 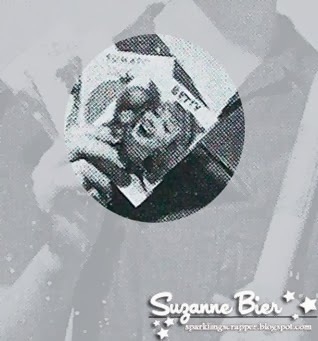 I changed the word on the seed packets from “Beets” to “Betty,” and added a face from another retro photo to the packet. 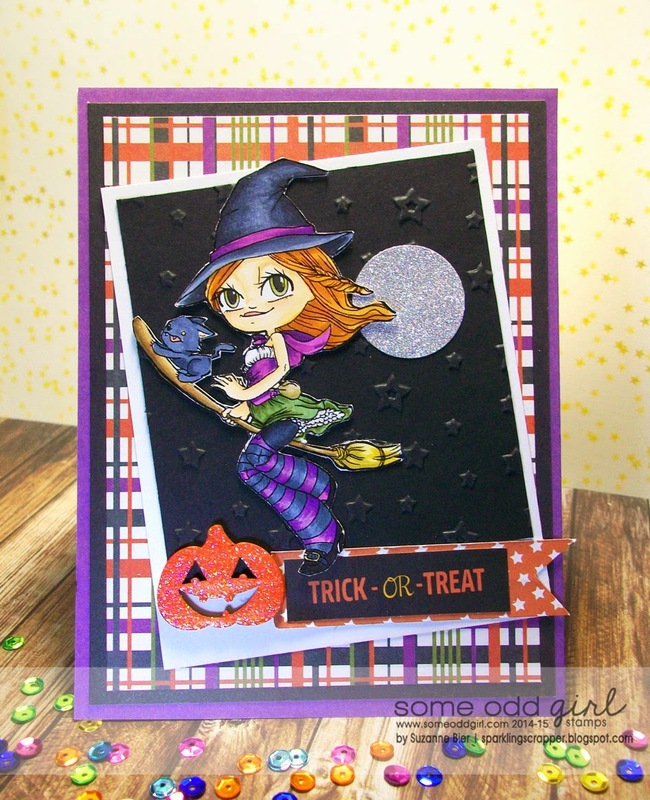 My friend Sparkle also has a Grim Creeper card to share, so pop by her blog to check it out! Trick or Treating with the Odd Girls! Our hop this week is full of spooktacular Halloween Tricks and Treats. Don’t worry, our tricks won’t be too scary! AND, just like trick or treating for candy, you don’t want to skip any houses…or blogs in this case! In order to win TREATS, you must leave a comment on each of the Design Team blogs, including mine! You can Trick or Treat with us thru midnight EDT on October 31. Winners will be announced Saturday, Nov 2 on the Some Odd Girl blog. 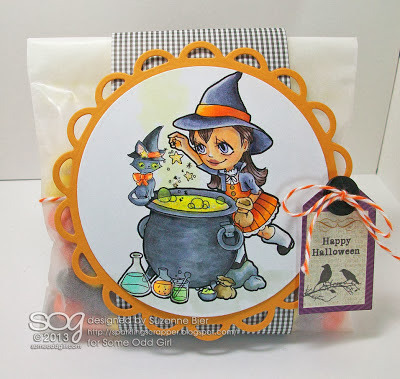 I’ve got a TREAT to share with you today…starting with today’s project…a treat bag featuring “Cauldron Tia” and “Witchy Kitty“! A SWEET sample pack of “Odds and Ends” ribbon! The prize pack contains four bundles of ribbon in four delicious neon colors (each is 1 yard long)! Thanks for stopping by today! The next stop on your spooktacular journey is Katie‘s blog! Ring the doorbell and see what you get! Hi, everybody! It’s time for a new challenge at Sparkle Creations Rubber Stamps! This week, we’re challenging you to create a center or side step card. 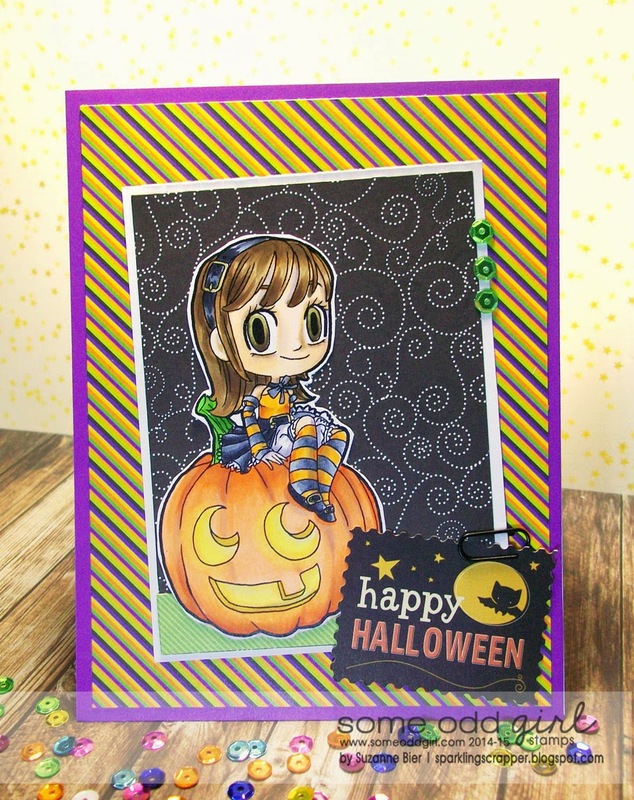 I made a center step card featuring “Broomstick Lucy” based on this Splitcoast tutorial. To play along in our challenge, upload a photo of your project and provide a direct link in the linky widget at the bottom of this challenge’s post at the SCRS blog. To be eligible for the challenge prize, you must use a Sparkle Creations image on your entry. The deadline for challenge #116 is Sunday, November 3 @ 9 PM PST. 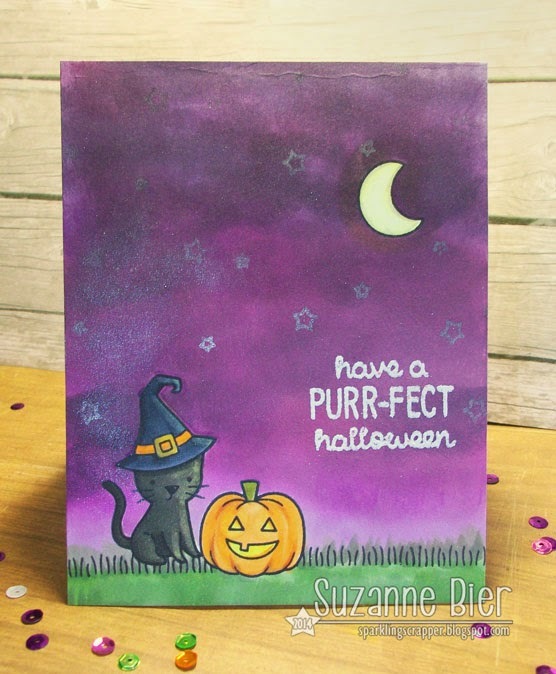 TGF Garden Variety Tuesday: Halloween Colors! Hi, Friends of the Farm! It’s time for a new Garden Variety Tuesday challenge at The Greeting Farm! I love that Halloween papers now feature more colors than the traditional orange and black. The pops of purple, blue, and green on some of the newer collections make them usable all year long! The fabulous prize: A random participant will be selected to win a digital image of choice from the TGF store. But, WAIT! Each week, our friends have the opportunity to DOUBLE that prize to either two digis or, you can trade those two digis for a SINGLE rubber stamp of choice, as long as we have 20 or more players each week, so encourage all your friends and family to play along! Thanks so much for stopping by today! Hope you’re having a wonderful week so far!